Please use the listing of natural Northern California hot springs below to assist with finding the best soaks near you. Although the majority of hot springs are located in the southern portion of the state, the north does not disappoint with its diverse and less crowded environment for enjoying naturally hot water fed pools. Northern California spans the state’s northernmost 48 counties and contains redwood forests, along with the Sierra Nevada, Yosemite Valley and part of Lake Tahoe and Mount Shasta. For navigational ease, we have drawn a line straight across at San Fransisco to divide the regions. With the wide expanse of mountain ranges and elevation variances, northern California can have diverse weather patterns. Snow and wet conditions are not uncommon. There are also several seasonal hot springs so it is always a good idea to know the area you are headed into before going. We denote if the spring has seasonality restrictions to help guide you. Hot springs in Northern California offer unique geothermal pool experiences at destinations like Travertine Hot Springs in the Humboldt Toiyabe National Forest and the off-grid resort of Wilbur Hot Springs. Non-commercial hot springs are generally located on public national forest or BLM land. These soaks lean toward the more natural side. Hot pools can be found either roadside or off the beaten path and may involve varying degrees of hiking. Not all public hot springs have camping available on-site, but you should be able to find a place to rest your head in the general vicinity. Many of these hot springs are clothing optional, especially the ones further away from civilization. Commercial hot springs in Northern California have a private owner and are typically developed in a fashion towards more comfort, range from rustic pools to five-star resorts and usually have overnight accommodations of some fashion. Most also offer amenities like massage, yoga, swimming pools and a place to eat. 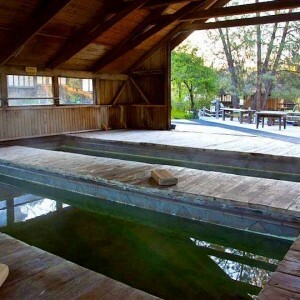 Popular Northern California hot springs include Calistoga Hot Springs, Orr Hot Springs Resort and Harbin Hot Springs. Popular regions where hot springs are located include the cities of Calistoga and Ukiah. The Northern California hot springs listed below features directions, descriptions, pool conditions, ratings, reviews, photos, videos and facility information and include if they are clothing optional, RV/ pet-friendly and have seasonal access restrictions. A statewide map of California hot springs is accessible from the homepage.